The Manchester Wall is located below the Manchester Bridge and at the western end of the Floodwall. It offers multiple routes for trad climbing, sport climbing, and top roping. 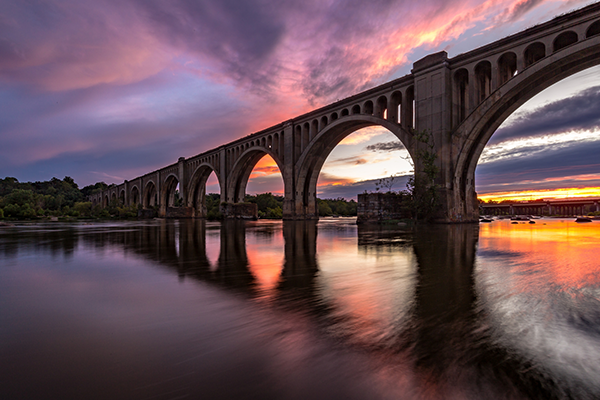 The 60-foot granite wall is a remnant of the Richmond and Petersburg Railroad Bridge which spanned the James River for much of the nineteenth century. The routes offered at Manchester Wall, and its three adjacent pillars, are superb for recreational and experienced climbers alike. Manchester has a total of 43 routes, ranging in difficulty from 5.4 to 5.11a, most averaging around 5.9. To learn more, check out this handy guide to climbing the Manchester Wall, courtesy of Michael Greeby.